Spend the morning with us at Dairy Farm where we climb and abseil in an amazing natural environment right in Singapore! You will be with a professional instructor and experienced assistants, so you are in good hands no matter your level of experience. This is an introductory session, and can be used as practice. This is great for all, even if you have already done a bit of climbing and abseiling, or will help to prepare you for one of our treks as well as natural progressions for multipitch climbing. This is a chance to try rock climbing with the safety of a top rope. 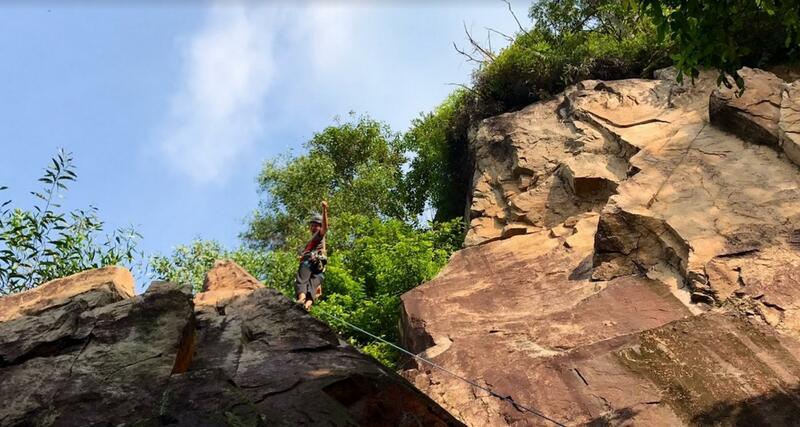 We will have 2 to 3 routes to try, (and maybe more if there's enough time) Rock climbing grades are 5, and 5c, If you arent sure what that is, we will explain! We will introduce to recreational abseiling techniques, systems and equipment used during an abseil session. Participants will be exposed to, and will use, a variety of equipment with an aim to developing personal abseil skills. All equipment is provided (excluding chalk and rock climbing shoes) So wear shoes with a groovy grip! We will also bring a couple of descenders for you to try: ATCs and Figure 8’s. If you don’t know how to abseil .. come learn. If you want to try out different descenders and ropes .. come experiment. If you know how to abseil .. come practice. Please bring your own gear if you have and want to try it. Harnessess and helmets are provided. This fun morning will have you wanting more practice, so once you have mastered the basics, if there's time we will abseil down a much larger wall to complete the day! SNAS Level 1 is not required. SNCS Level 1 is not required. In case of bad weather or rain, we will schedule a rain make up day in July. In the event of bad weather starts before 2 hours into the event, we will have a make up day.